Today, we visited the place where it all got started. 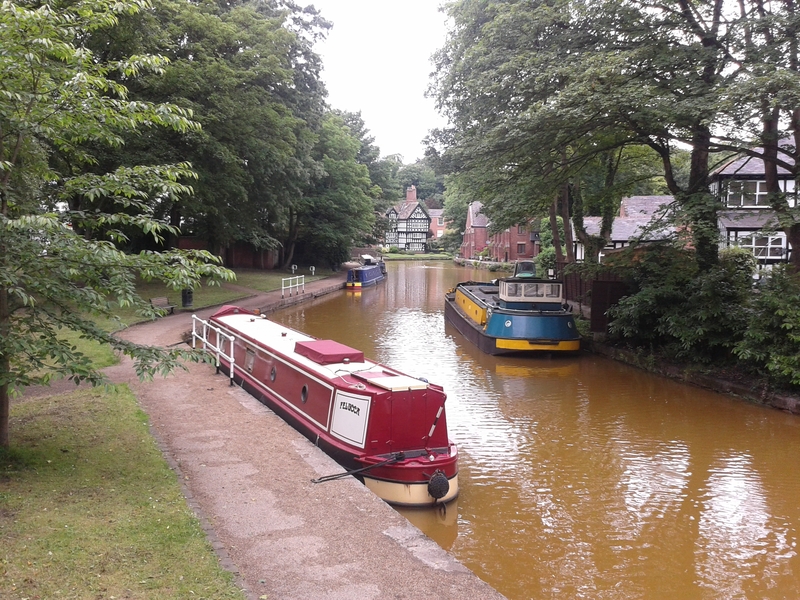 The first significant British canal, and the birth of the industrial revolution. It’s Worsley. A small, pretty town on the edge of greater Manchester. Nowadays, the roar of the nearby M60 hovers like smog over the village green. 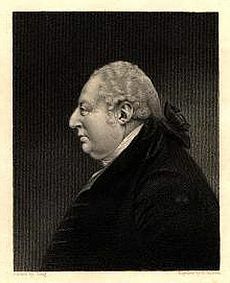 Back in the eighteenth century, the whole lot was under the avaricious eye of Francis Egerton, the 3rd Duke of Bridgewater. The Duke knew there was coal under his land, lots of it. And he wanted to get at it. So he built over forty miles of tunnels and subterranean canals underneath his land, to dig it up. This rat’s nest of underground workings was remarkable, with three levels of canals connected by innovative boat lifts. 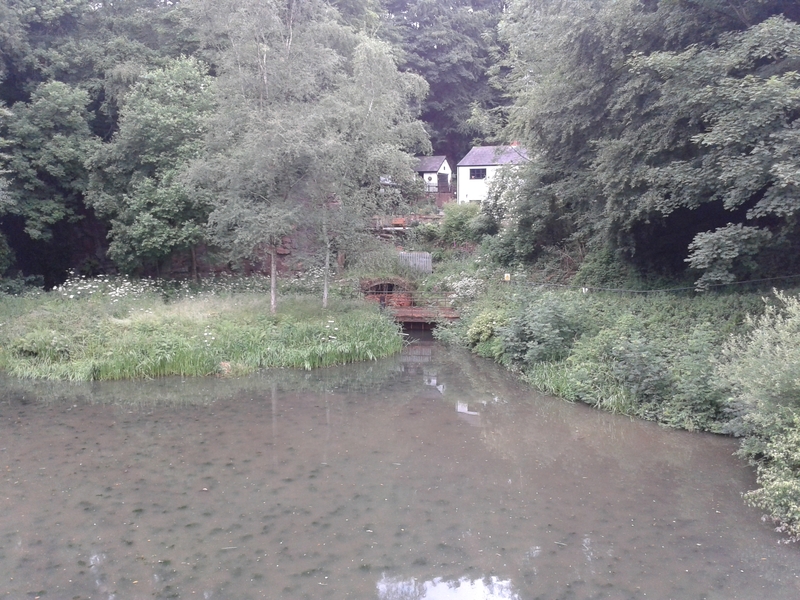 For such an impressive effort, what remains today is pretty underwhelming: no museum or visitor centre, just a fence, a murky pool, an overgrown tunnel leading into the hillside, and “keep out” signs. Getting all this coal out was no good if he couldn’t sell it to someone, and Worsley was a happy village in the middle of nowhere. So Francis got in our hero James Brindley to build him a big canal so he could take the coal to somewhere where people could buy it. Namely, Stretford: 5 miles away (and just around the corner from where Old Trafford stands today, hence the Stretford End). This was the Bridgewater Canal. The Duke became absolutely minted off both the coal and the canal tolls, and the Bridgewater Canal was eventually extended north to Leigh (and thence to Liverpool), and southwest to Runcorn. However, it was the original 5-mile section which posed engineer Brindley with one of his trickiest challenges. The new canal needed to cross the Irwell near Barton. The aqueduct he devised and built isn’t a patch on later magnificent efforts like Pontcysyllte or Edstone. But it was startling for being one of the first large aqueducts; legend has it that Parliament, asked to give their blessing, were so incredulous that Brindley had to build them a model in cheese to convince them that his “canal in the air” was indeed feasible. This was all well and good for over 100 years. 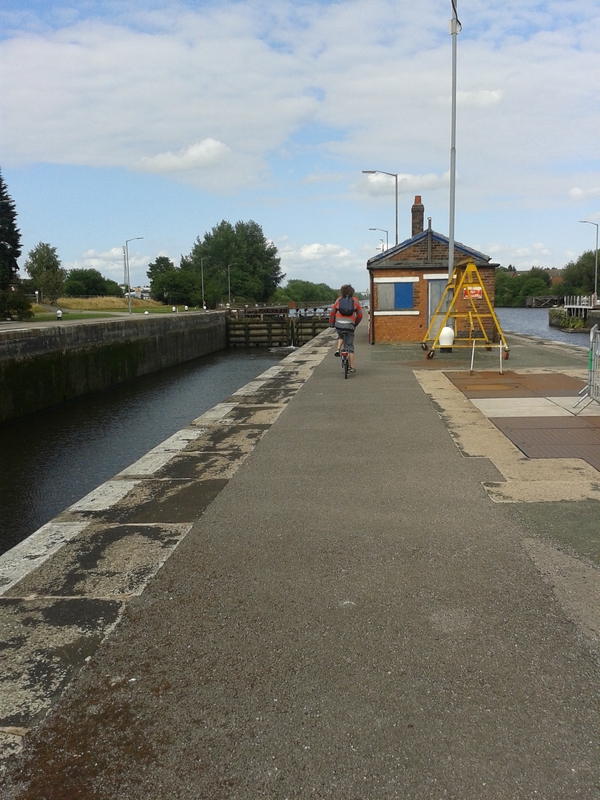 But in the 1890s, things had moved on and the puny old-school canals weren’t cutting it any more. The latest ruse was for a ship canal: an enormous waterway of outrageous dimensions, linking the Mersey with Manchester, and allowing massive ocean-going craft to make it directly up to Salford Quays from the sea. Big lock. Me on a bike. For much of its route, the Manchester Ship Canal (MSC) took the route followed by the River Irwell, and the Victorian engineers built a deep, wide channel in place of the river. 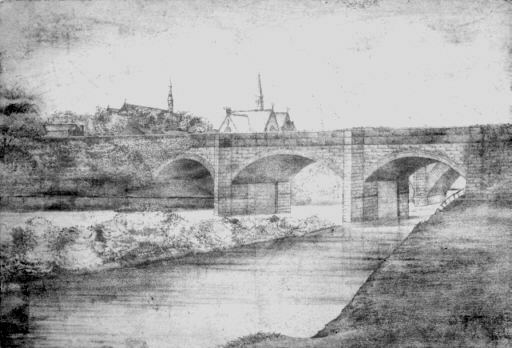 At Barton, Brindley’s stone aqueduct was an obstacle to the MSC’s progress: its arches were neither high nor wide enough to let through the great ships intended to sail up to Manchester. So they commissioned an engineer called Sir Edward Leader Williams to solve the problem. And he built what is now considered to be one of the “Seven Wonders Of The Waterways”, and the third we have encountered in Felucca: the Barton Swing Aqueduct. When the big canal below is free of shipping, the aqueduct stays closed. 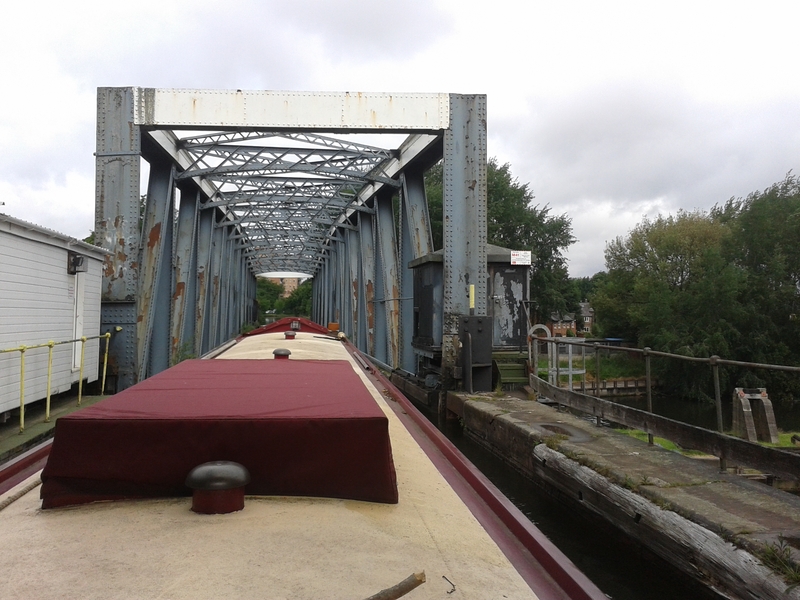 Boats on the Bridgewater Canal above can pootle happily across the aqueduct on their way from Worsley to Stretford. When a big ship approaches on the MSC, the aqueduct is swung open to let them through. It pivots on that island in the middle of the ship canal. Gates prevent the water from leaving the aqueduct itself; other gates prevent the water from leaving the severed ends of the canal on either side. The 100m-long trough weighs 1,450 tons PLUS 800 tons of water inside it. As Wonders go, not seeing it swing is a shame, and the experience of actually crossing it is relatively mundane compared to #1 (Pontcysyllte aqueduct) and #2 (Anderton boat lift). However, it’s undoubtedly up there as one of the most audacious bits of brilliant engineering problem-solving out there. Hats off to Sir Edward. View from the swing aqueduct. 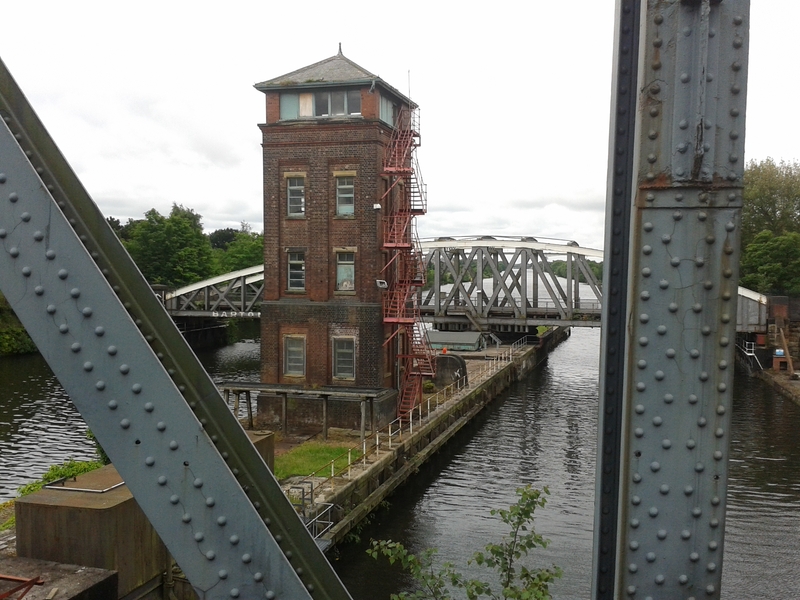 The brick building is the control tower; the bridge in the background is the swing road bridge next door! So, should one conclude that capitalism is not a transcendental force of nature but is in fact has historically and geographically situated practice, and like a model of cheese may moulder and turn blue and smelly, then get thrown in the (compost) bin? I’m catching up on your adventures and realised you are getting closer to places I recognise. A College friend of ours used to be a Methodist minister in the Worsley area. 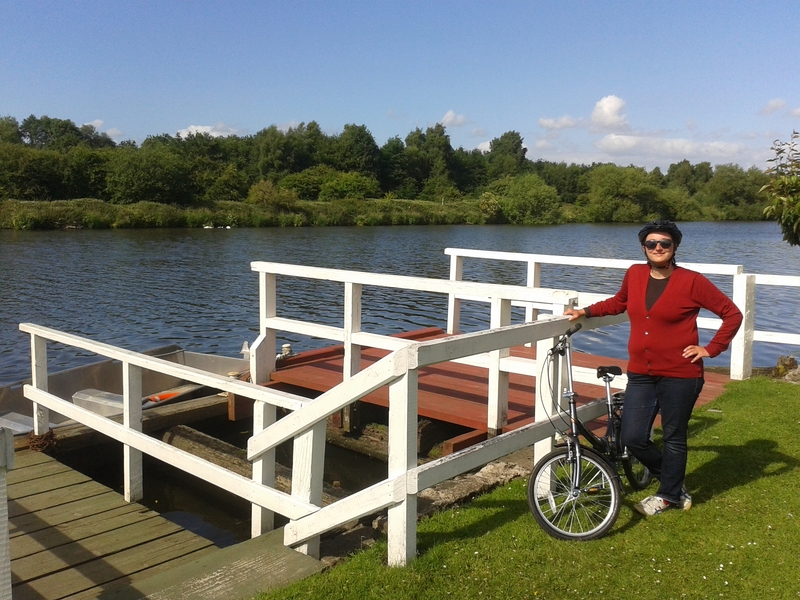 When we visited her we went for a walk along the bit of canal you have described. 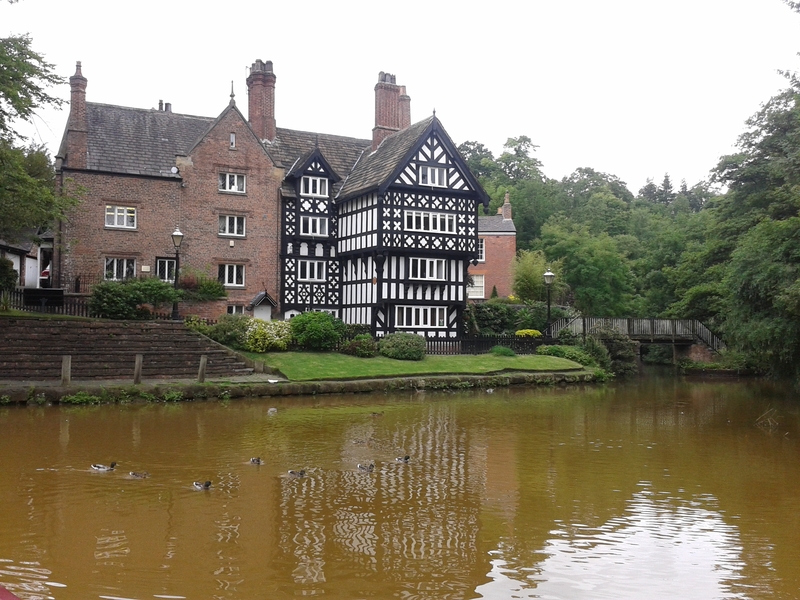 We also had a College friend who lived in Frodsham and we went with her on a trip on the River Weaver with her folk club. Nice scenery “up North”, eh ? Wait ’til you get to the Pennines and you will see why I miss the hills at times. Happy boating.